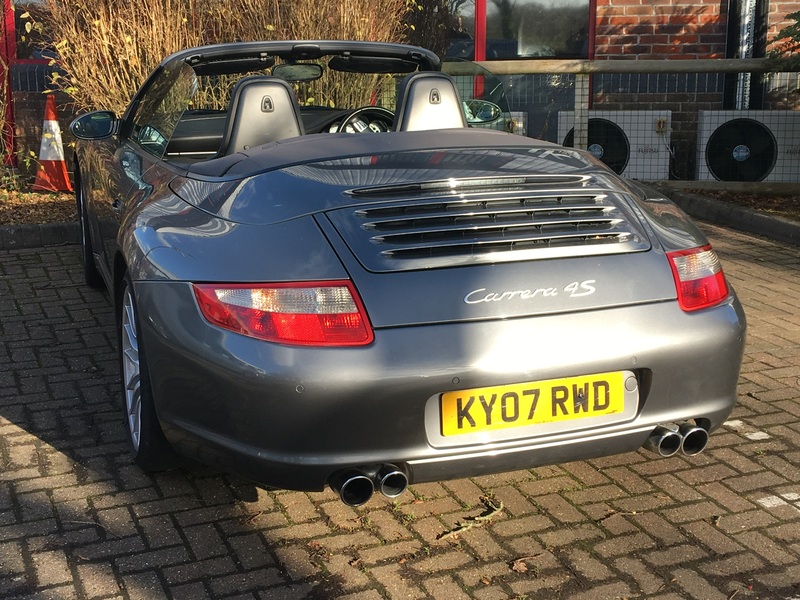 A quick introduction to start - I bought a 2007 C4S Cabrio in December (thwarted by snow again so not much use since), it has covered 105,000 miles and had a full Hartech engine rebuild less than 10,000 miles ago. Incidentally, for those who like to analyse engine failure stats, this had an engine replacement by Porsche under warranty at 40,000 miles, and further bore scoring (and strangely worn crank bearing) requiring a Hartech engine rebuild at 95,000 miles, so at only 55,000 miles on that engine. So as I haven’t managed to drive it much I’ve been sorting out a few niggles and adding my own touches such as Zunsport grilles, and LED rear lights. I’m also considering front DRL’s, but are they really worth it? I’ve heard you need to turn the sidelights on for the daytime LED strip to work. One issue I can’t resolve is the PCM2.1 won’t clear it’s memory or retain any new stored destinations etc. I can go through and delete all previous places visited & favourites, and add my own, but after the ignition has been turned off and on again, those deleted places have returned and my saved data has disappeared. It wouldn’t be so bad but it keeps defaulting to an address in Poland, so when I enter a destination I have to start by scrolling through the countries back to the UK. I have tried the 1, 4 & 8 reset, tried latest sat nav & unit software upgrade CD’s and also tried removing the PCM from the console so all wiring was disconnected, but when plugged in the previous destinations are still there. Could this be reset with PIWIS or possibly ‘flashed’ by a repairer, or will it need a replacement unit? It’s a weekend car and I’d rather fix this if possible than spend £1000 on an aftermarket unit with fibre conversion. Photo of the car on a sunny December day! Spike, the PCM is a strange one my initial thought was that it had been replaced at some point with a unit that had been originally in Poland so had been set as the default, but that is only a thought and if so unsure how you would reset it as a UK default unit. I fitted the decatine wiring loom £35 that enabled them to run as proper DRL and the lower LEDs were on with the idnition then when I turned on the sidelights the LEDs dipped to 50% power and with the headlights on they stayed at 50% but the middle strip also came on. Hi spike, and welcome to the forum. I've got the front LED lamps and just turn the side light on for the stip then, pull the fog lights on for the bottom LED's to come. Not bothered about wiring to come on with ignition. As for the pcm unit I believe Porsche have a software update for it? Or am I dreaming it up ? Yes I’ve ridden through Poland on a bike and had a great time, but I think this was a place visited that it happens to have frozen on, as there are also entries via Folkestone & Germany before the Poland one. The problem is when entering a new destination it brings up the last one to edit, so I always see Poland! I should Google that address though as it will be interesting to see what’s there - maybe an OPC! Alfaian, thanks for the welcome. Yes I tried the updated CD’s to see if that would upgrade the firmware, but no change. Still considering the £300 odd pounds for front DRL’s. Phil, not much difference in price over there! I've also got rear dectane LED' and both update the car immensely in my opinion. I've also swapped the pcm unit for a pioneer dab/nav unit. Its either a software fault or the unit is looseing its main power supply with ignition turned off . Unit out and a quick check of the feeds to prove the latter . I cant remember offhand but check the settings for a factory reset. Thanks Demort, I’m erring towards a software fault as it still functions with ignition off, and if it was a power fault would it not stick at the last inputted data rather than data that appears to be from some time ago? I’m just hoping a PIWIS reset has the ability to bring it back to life, otherwise I need to think about a replacement or a more modern option. I have a full service/inspection booked in at Hartech in April so I guess I’ll find out then. On the subject of DRLs do look at the sequential variant These add a nice modern touch when indicating as opposed to the standard version that blinks. Matter of preference off course. When you update the maps, it thinks it is in Stuttgart until you drive for a bit then it finds it's bearings. I would guess yours had the pcm head unit removed, but the Navigation was still powered but not used, then prior to sale the pcm was reinstalled. Check all the fibre optics are in the right configuration. The power side is the only other thing i could think of other than software to check .. I think if it was me i would disconnect the battery or remove the pcm for an hour or 2 to let it totally power down then try it along with seeing if theres a factory reset in the settings. from memory you have to manually delete every entry on these on the nav , there is no 1 click delete and the ones i have done worked fine . Thanks Jake911, I’m liking that idea! Yes, I can delete each entry individually & even add & store my own new ones, but when I come back to the car and turn the ignition on the old ones are back and mine have gone. The sat nav works fine otherwise, so no issue with satellites. I’ve tried the factory reset in the settings and also tried removing the unit, but maybe I’ll try disconnecting the battery or fuses for a couple of hours as suggested. Interesting theory, it does have the triangle errors shown although it also has a Viseeo Bluetooth unit which I know can muddle up the optics. It all currently works though, just the issue I can’t wipe the previous destinations or store new ones. Oh, and it does the same with the radio, won’t delete existing stations or store new ones after the ignition has been off, so again it kind of points to a PCM software fault rather than the nav unit.